Ryzen motherboard options are starting to pile up. MSI has put together a landing page showcasing its lineup of AM4 platform motherboards for Ryzen, along with a list of vendors showing where to buy its products. 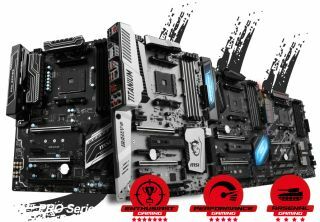 What's interesting is a Pro series motherboard depicted in MSI's banner image at top that has not yet been announced. Three of those appear in the banner image, including the X370 XPower Gaming Titanium, X370 Gaming Pro Carbon, and the B350 Tomahawk. To the far left is blacked out motherboard with silver or white accents. You can see two reinforced PCI-Express 3.0 slots and other features similar in appearance to the X370 Gaming Pro Carbon, but with different styling for the board's heatsinks and other subtle differences. Ryzen is set to release to retail on March 2, at which point we expect to see a steady ongoing increase in the number of AM4 platform motherboards. In the meantime, we've put together a list of AM4 motherboards from Asus, Gigabyte, MSI, ASRock, and Biostar with links to where they can be pre-order (if available).